Protecting critical data and systems is a fundamental component of any enterprise or SMB (small and midsize business) security strategy. The best way to protect your organization is by ensuring the security of privileged user accounts using privileged access management (PAM). Improve security within your organization with advanced privileged access management (PAM). WALLIX provides a robust PAM solution that helps organizations improve security by making it easy to monitor and to audit the actions of all privileged users in real-time. Our latest product offerings provide advanced capabilities and integrate smoothly into existing security infrastructures to provide a flexible solution for both large organizations and SMBs. The WALLIX Session Manager allows IT administrators to easily manage and monitor all user access and activity in real-time. Super admins can maintain access governance by limiting users to only have access to the critical resources they need to complete their job duties. Administrators can create and embed connection rules directly into the Bastion that automatically grant or deny access to users based on context relevant configurations and access validation workflows. Advanced reporting and audit capabilities also help ensure organizations are meeting compliance regulations. The WALLIX Session Manager makes it easy for security administrators to manage and monitor all user access and activity in real-time. Determine if sessions are suspicious using advanced technologies like whitelisting/blacklisting, optical character recognition (OCR), 4-eyes supervision mode, widget event reports, keyboard input flow analysis, and more. Based on what these technologies detect, security teams can be alerted and sessions can be automatically terminated to stop attacks in their tracks. Create comprehensive behavioral analysis and business intelligence reports by gathering data from all of your security systems through seamless integrations. Easily accelerate incident analysis and response to further improve security. The WALLIX Password Manager makes it easy for administrators to maintain control over passwords and strictly enforce password policies for your resources. All passwords and SSH keys are secured within a centralized vault or can be extracted from other third-party vaults for seamless password security. 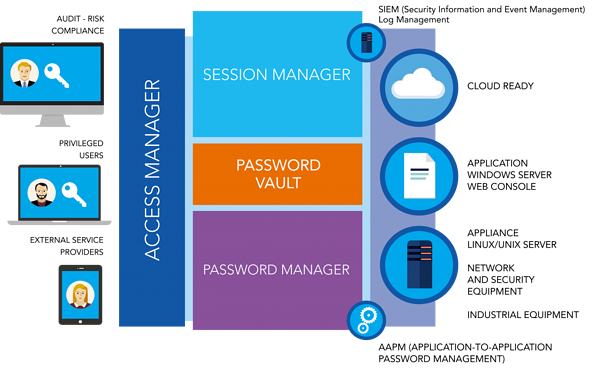 Administrators can use the password vault to enforce password rotation and revocation through customized workflows. They can also use Application-to-Application Password Management (AAPM) to authenticate passwords between applications through the REST Java Interface using credentials and SSH keys. Utilizing these tools optimizes password security and significantly reduces risk exposure within enterprises. Secure passwords in a centralized vault and enforce strict password policies with the WALLIX Password Manager. Simplify access management and monitoring of your Bastion clusters with a customizable and centralized interface that includes a real-time list of all privileged user logins, sessions, and actions. The Access Manager allows administrators to completely customize the look of the interface making it easy for them to monitor privileged user activities. They can determine how to classify files, transfer files between workstations, and easily communicate with other Bastions via an encrypted channel. Simplify access management with a customizable and centralized administrative interface. Administrators can also create Bastion clusters to maintain control over critical resources when utilizing multi-tenant architecture. This helps organizations have a clear picture of who and how resources are accessible across complicated system integration. The access manager also helps ensure compliance as it includes its own unalterable audit trail of all sessions. The audit logs include multi-criteria search capabilities allowing admins to search within script and session metadata for suspicious activities. WALLIX now offers two new product packages and one new offer to help businesses scale PAM to fit their specific needs. The BASTION Professional package makes it easy for SMBs to improve security using WALLIX’s easy-to-deploy PAM solution. BASTION Enterprise provides the most comprehensive and customizable PAM solution for enterprise organizations. WALLIX provides organizations with comprehensive security through advanced privileged access management tools. Don’t wait until your organization has fallen victim to a cyberattack or data breach to improve your defenses, secure your organization and ensure you meet compliance regulations with the WALLIX Bastion. Want to learn more about BASTION Professional or BASTION Enterprise? Contact us for more information. to receive our best articles! WALLIX is a software company offering privileged access management solutions to help enterprises, public organizations and cloud service providers protect their critical IT assets including data, servers, terminals and connected devices.